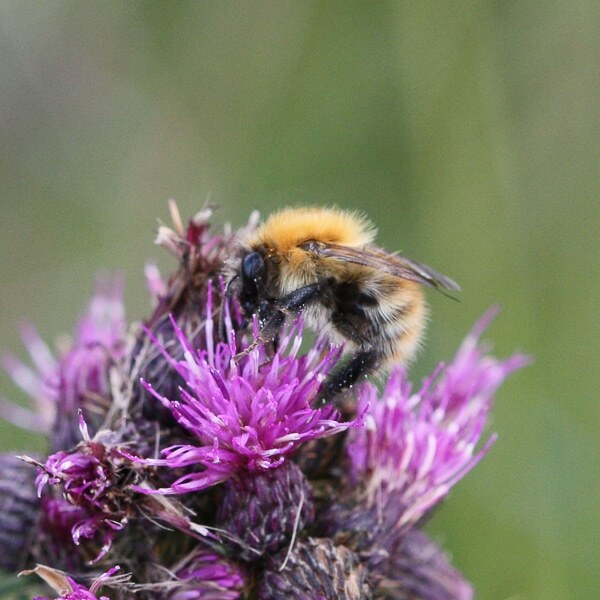 One of the species we wanted to see if we could whilst on Orkney was the Great Yellow Bumblebee (Bombus distinguendus). 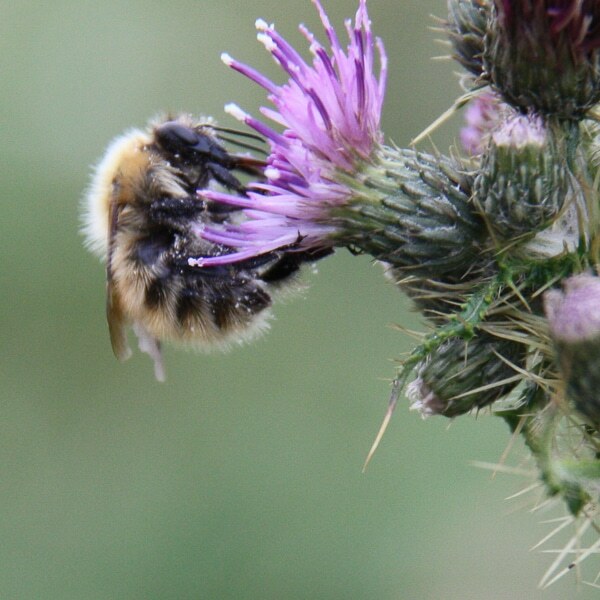 It is a species in decline in northern Europe and is one of the UK’s rarest bees. 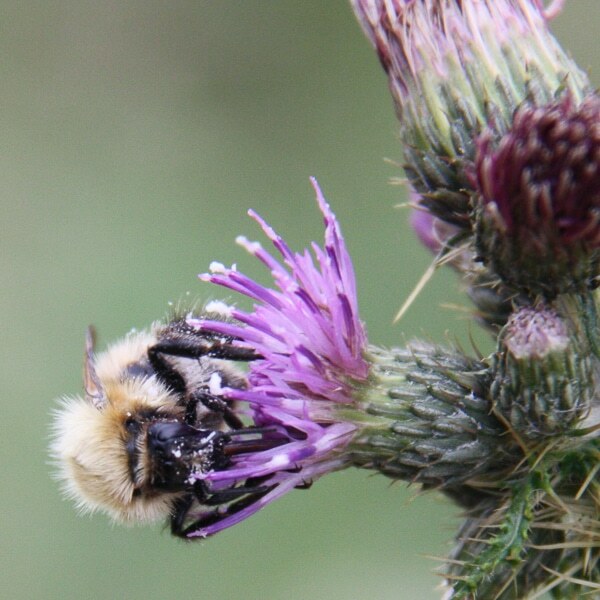 Although it can turn up throughout the British Isles, the Orkneys and the Western Isles are the best chance to see this large and distinctive bee. 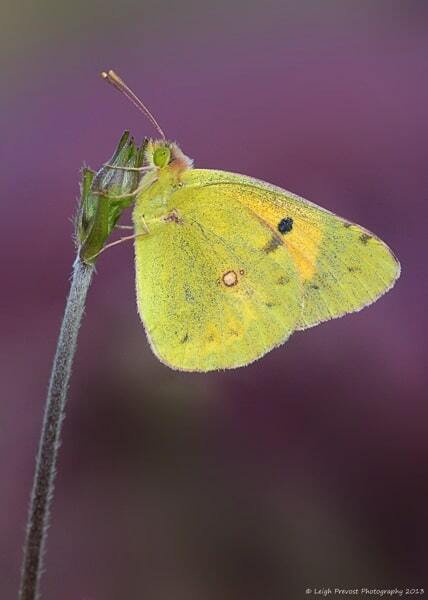 Of course, every site on Orkney with an interpretation board suggests you might see the Large Yellow here – along with hen harriers, short-eared owls, otters and Elvis. Nevertheless we kept an eye open in all the likely habitats. Eventually on another walk in another area where this elusive bee might be found Jan decided to examine the clearly non-native, but extremely large, fuscia bush. Just on the basis that all bees like fuscias. I don’t know if that’s true but certainly seemed plausible, and indeed there we found our first two or three GYBs. We even managed to get a few snaps, but these were mainly of bees’ bums hanging out of the flower bells. 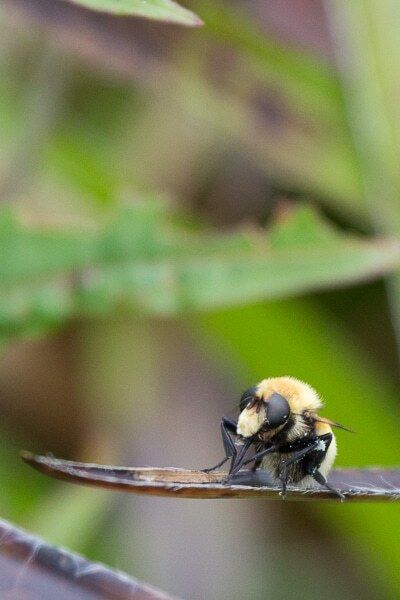 Surprisingly well named, this bee is large and yellow, and deserves close inspection to see the subtle yellow banding across much of its body. 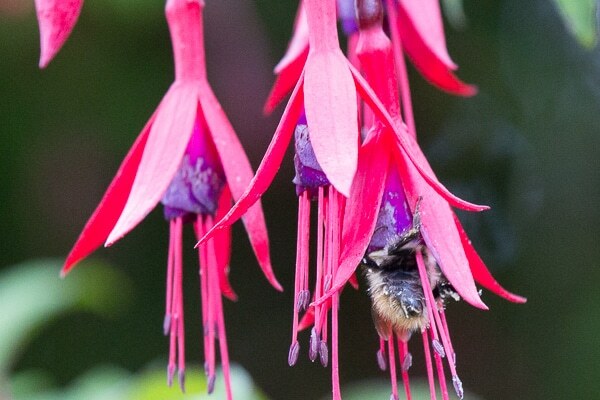 We saw a few more away from the fuscia but in high winds – to us, not to Orkney – the bees were a bit more elusive. No sooner did they leave one thistle flower than they were 20 metres away clinging on to the next. Finally we find one, exhausted from its exertions, perched on a reasonably sheltered leaf where we could get some better views, although pin-sharp photographs were still tricky in the wind. Having got our eye in for this bee we have now seen a few more, and hopefully with better weather due we may get a chance for some better pictures in the next day or two. We’ll let you know. In the meantime here is an extract from the Natural History Museum’s conservation notes for this species. Bombus distinguendus is a flagship species for the Bumblebee Conservation Trust in Britain and a UK Biodiversity Action Plan species. Bombus distinguendus is classified as Nationally Scarce. Multiple factors threaten B. distinguendus, chief among which is often habitat removal, particularly with the reduction of red clover cultivation since 1940 due to changes in farming practices. The main driver of decline is believed to be a reduction in the density of food plants with deep flowers over large areas of suitable grassland habitat (Williams & Osborne, 2009). Continuous availability of suitable habitat within and across years is important, because the bees may not be good dispersers, and are not known to have colonised any new areas across barriers of unsuitable habitat. Climate change is unlikely to have been the main driver of decline in the past. Although there is an interaction between the effect of food-plant availability and climatic specialisation and a future impact is possible (Williams et al., 2007). The impact of pesticides is unknown. I thought I’d leave until the last before commenting on the self catering cottage we had in Birsay, but frankly I could have written it on day one. We walked in and said ‘wow’ and walked out and said we wanted to kill the next people in so we could have another week. OK, maybe the last bit is a slight exaggeration, but you get my drift. The place we are talking about is Sea End, one half of the Cleatfurrows self-catering house. The other half is Palace End which overlooks the Earl’s Palace. Our half overlooked, yes you guessed it, the sea. From the massive kitchen window (in the massive and well appointed kitchen) we could see the sea, the Bonxies and Arctic Terns whizzing up and down, and the people walking up and down the Brough of Birsay. If there had been Orcas passing – which there have been on many occasions, we would have had great views. And on the balmy summer evenings, not an expression you hear often on Orkney, we were able to sit on the garden wall with a cold beer and a warm telescope watching the the world go by. So would I recommend this as a place to stay. Yes I would. 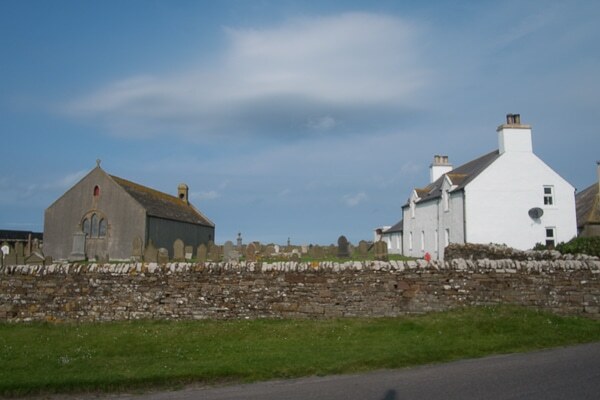 Not only is it well located on the north west coast of mainland Orkney it is also well located in Birsay itself. One wall of the house is the boundary wall of the graveyard, so it would be the best place for telling ghost stories to your children to ensure they get a good night’s sleep. For just the two of us the house was more than big enough. An en-suite master bedroom and a separate shower and toilet meant we soon got into a his and her’s routine for the bathroom. Bunk beds in the, for us, spare room would make this a good size family unit. All the usual instructions that come with a cottage – do this, don’t do that – were well explained and clearly labelled. Even the fiendishly complex recycling was child’s play. Our arrival was greeted by swallows in and out of a nest over the front door, and by a very welcome bottle of red in the kitchen. Our departure was signalled by the swallows fledging a barrel-load of young ready to feed up for the flight down to South Africa. (And several empties consigned to the recycling). I would also like to say a big thank you to Sarah, the owner, for the prompt and courteous communication throughout the booking process and for dropping us a line at the last minute with latest news of a new archaeology dig opening up which she thought might be of interest – it was. So – would we stay here again. Most certainly and we would be happy to recommend Sea End to anyone. But the truth is that, because there is so much to see and so much to do, the chances of us coming back are limited. But if we do, Sea End will be the first property we will look to see if it’s available. For more information visit www.cleatfurrows.co.uk – enjoy. So. You’re on Orkney mainland. You feel that you should really ‘do’ another island in the group, but it’s all a bit difficult to choose. They are all different. Some you need transport. Others are small enough to walk round – but what’s the route? And then browsing through one of the many magazines devoted to helping you make the most of your time on Orkney is a full page advert offering guided walks with the Eday Ranger. No brainer. A quick exchange of emails and our place is booked on this free guided walk. We order packed lunches, discover how to buy a ferry ticket (c’mon I don’t even use a bus), and with the usual health warnings from the ranger about the the weather we’re ready to experience the island of Eday. You say tomato and I say tomarto. Well it turns out it’s Edee. We’ve been staying in Birsee. All those little ay endings apparently mean isle or island and are pronounced ee. That’s your lesson for today. Anyhow we get the right ferry and get off on the right island – not a foregone conclusion where we’re concerned – and are met by the Eday Ranger, Jenny Campbell. Much to our surprise, but to our great pleasure, we are the only people on this particular Friday walk so we have Jenny entirely to ourselves. 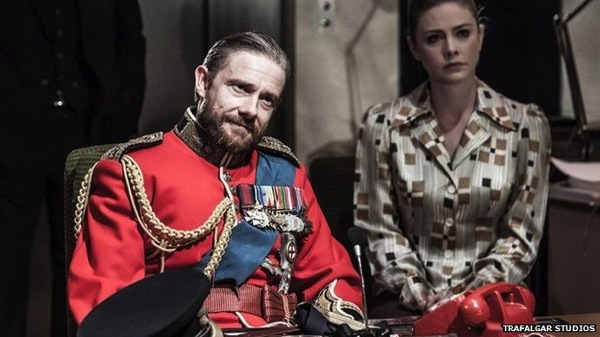 Of course, that may not be so great for Jenny since she has only us to put up with for the next five hours or so. We are collected from the ferry by Jenny and we drive to the start and end point of our five mile or so circular walk – although let me say at the outset it didn’t seem like five miles. And if there were any people who found the gentle walking too much there were shortcuts a’plenty that would have cut the length in half. The walk is a mixture of archaeological sites and wildlife – history and natural history. The walk concludes with a visit to the heritage centre, more of which later. So what do you get for your money? Remembering, of course, that the walk is free. 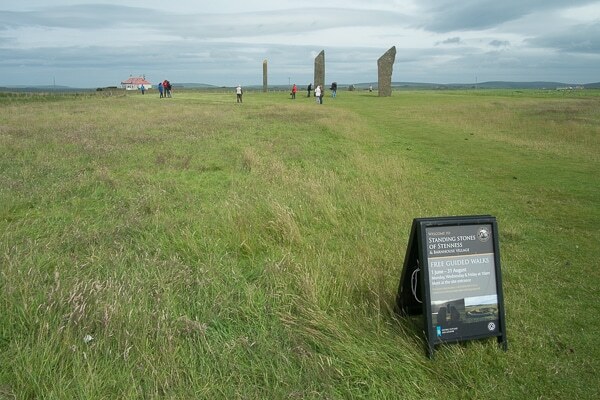 Well chuck a rock in pretty much any direction direction on Orkney mainland or islands and you will hit a standing stone, chambered tomb or a neolithic house and the same is true here. 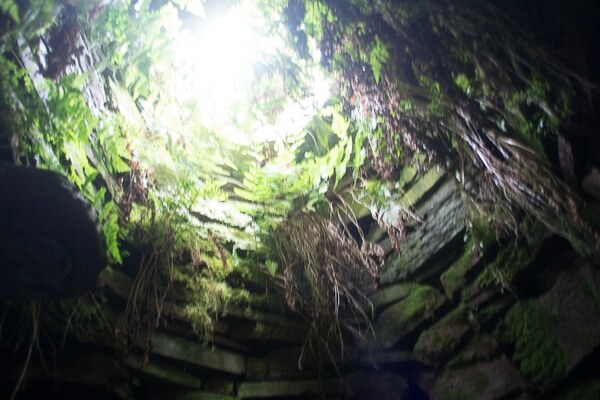 The chambered tomb is particularly fine, although a slightly odd skylight has been added to keep the elements out whilst letting the light in, which means that this tomb has a fine crop of ferns hanging from the ceiling. In terms of wildlife it will depend what decides to show its face when you are there. 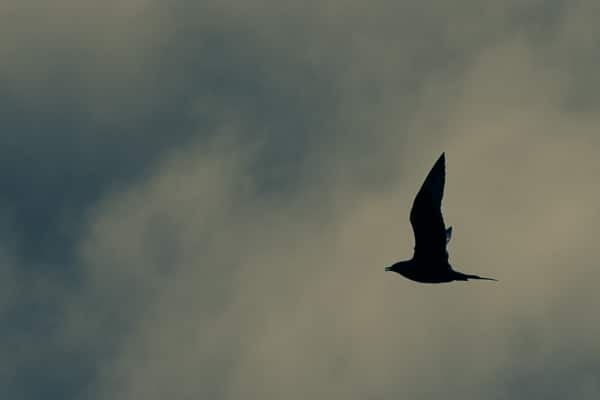 Great and Arctic Skuas are certain as are breeding Arctic Terns in the summer. We were greeted on arrival by three Red-throated Divers in the glorious summer plumage. The ubiquitous Curlews and Oystercatchers throng the fields, and a Buzzard – almost a rarity on Orkney – circled once overhead before drifting off south, untroubled by birds which, in a southern county, would have launched themselves at this intruder into their breeding territory. We weren’t lucky enough to see the resident Short-eared Owls or Hen Harriers, but a few of the islands Puffins were still bobbing in the bay, building up the final reserves before heading out into the north atlantic for the autumn and winter months. But the main thing you will get on the this walk – and certainly worth more than free – is the expertise and enthusiasm of the Ranger. Most people will have come across the idea of a wildlife ranger – primarily a conservationist with a bit of education work thrown in. 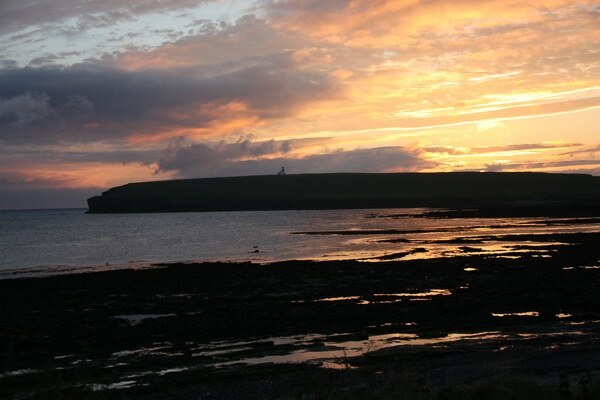 On Eday and apparently on the Orkney islands more widely, the Ranger is much more embedded in the community, and works with all their private and public partners to encourage a greater understanding of the natural environment throughout the whole community. The local primary school is about to almost double in size with the arrival of a large family just moving to the island. Whilst that primary school may not have all the facilities of a fully populated school in mainland Scotland, you can be guaranteed that the involvement of the Ranger will ensure they start with an understanding of their natural environment that many children never discover. However you get to Eday, and whatever you do whilst you are there, you must pay a visit to the Heritage Centre. A cursory inspection of some the material suggests that many of the historical exhibits have been put together by one person and that is surely a labour of love. In addition there is a small salt water aquarium where some of the specimens from the shoreline spend a week or two before being released back to the ocean to be replaced by some of their neighbours from the Eday coast. Topped off with a DIY cuppa – chuck a quid in the box – makes this heritage centre definitely worth a visit. Everyone should take the opportunity to get closer to nature. 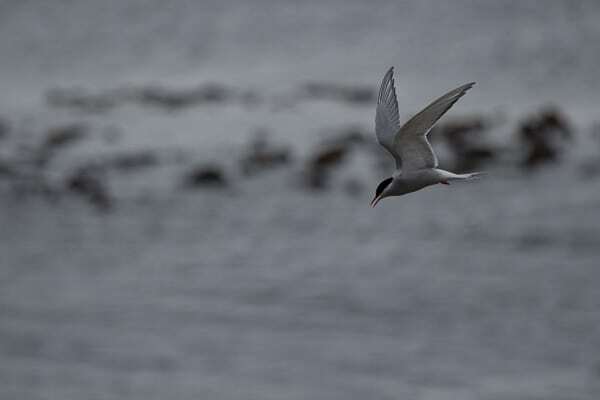 It is a privilege that I will never get tired of, and it is even more of privilege to do so in the company of a person who is as passionate about seeing a newly fledged Arctic Tern taking its first flight, as finding a deflated helium party balloon which may deny that tern’s chick their own fledgling flight. So when you’re in Orkney and wondering which other island to visit, pick up your iPad and email edayranger@hotmail.com – visit www.orkneycommunities.co.uk/edayranger/ for more information. And if you think wildlife and history isn’t your thing then Eday has still more to offer – just check out “the real Michael Knight” on YouTube. Of course we need tourists. I do not need tourists. I am not, you understand, a tourist myself. I am an observer. A traveller. A naturalist if you will. I go places to observe the natural and man made world and their interaction one on the other. I do not go places to chatter loudly to the rest of coach party about how cousin Emma-Lou will be sooo disappointed to have missed seeing this Stonehenge of Brodgar thing. Nor do I get in the way of the observer, the traveller, the naturalist when he or she is observing. OR TAKING PHOTOGRAPHS!!! 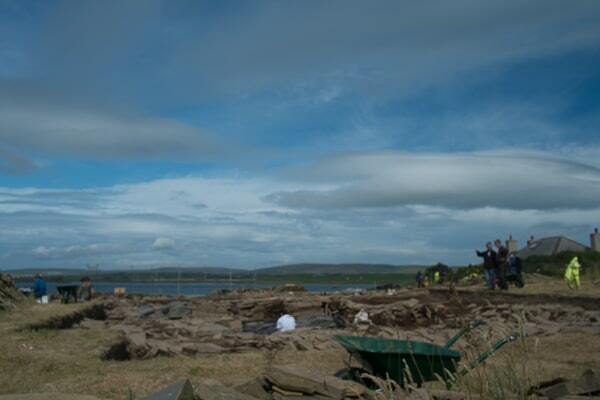 Of course the Ring of Brodgar is the built environment. It deserves to be teeming with life as much as Picadilly or Notre Dame. But somehow it begs for solitude and stillness. Indeed, there are those who believe that the Ring was a place of a more reflective nature. The absence of anything that suggested a permanent presence – associated houses, fireplaces, or storage buildings – makes one think that this was a place for the spirits rather than Emma-Lou. And what is certainly true is that one can observe the stones, travel around them, place them firmly in their landscape more easily when they are not seen through tourists’ eyes, or, more importantly, through the bright blues and reds of the tourists’ cagoules. But it’s the tourists’ footfall and the tourist dollar that keeps the conservationists in work. I may think I do not need tourists. But we all do, if we are going to keep the things people like me want to selfishly observe. So here I am. A neolithic photographer birdwatcher farmer sat in my house watching the sea. OK, I can only watch the sea because my roof has blown off. And the walls have fallen down. And the sea is about a mile closer than it was 5,000 years ago. But there we have it. Prehistoric sea-watching is much the same as it has been ever since. Lots of sea and bugger all on it. Where we are staying, round at Birsay, it is a different kettle of sea-life. Great and Arctic skuas respectively lumbering and flashing hither and thither. Guillemots and Black Guillemots, Razorbills and Puffins whirling to and from their cliff ledges. Yes, Puffins on cliff ledges – they obviously do things differently in Orkney. But back to my neolithic sea view. 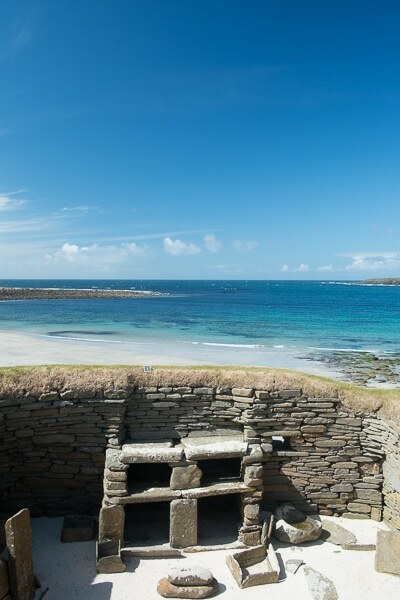 This was, of course, at Skara Brae. This was the prehistoric settlement discovered in the mid 19th century when a storm ripped away its grass and sand covering to expose a small settlement of half a dozen or so interconnected dwellings and a workshop or pottery. Apparently this housed 50 people although how we know that is beyond me. Actually another account says it housed 100 people so we don’t know. As I thought. The ‘houses’ are remarkably well preserved. At least what’s left of them is (if that makes any sense). The lower walls show the outline. Stone boxes that would have been stuffed with soft bedding material and covered in animal skins together with tables where prized possessions could be displayed show a good degree of civilisation. And like modern houses, when you just see the foundations they look terribly tiny and cramped. But when you enter the fully built version, as we didi in a replica construction, you wonder at the space available. As soon as something moves from being a 2D plan to a 3D construction the Tardis effect appears to take over. That which has been preserved for 5,000 years is now in danger of being lost – just through the chance of having been found. Being exposed to elements threatens, as does the tramp of thousands of visitors. Conservation now takes priority. The sand which supports the structures is regularly replenished with sand washed free of damaging salts. Visitors are kept at a respectful distance. Reproduction roofs are being installed over one or two structures to recreate the microclimate that would have existed in the stone age houses. Although frankly I didn’t see much evidence of trying to recreate the smog from boiling lobsters over open fires. And despite the picture, then as now, there was plenty of life in that sea to be caught and boiled. 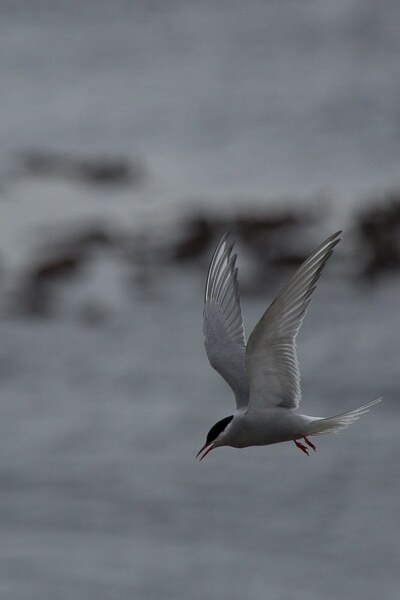 Arctic terns are annoying little buggers. Not content with 15,000 mile pole-to-pole round trips to their breeding grounds, they then spend the summer zooming about at high speed. Feeding. Feeding their mates. Feeding their young. Attacking predators. Attacking me. Which makes them very tricky to photograph. Until the wind blows, and then this mighty midget of a bird suddenly finds that when it turns into the wind it’s stuck, frozen in space for a few seconds while it works out its next manoeuvre. Which finally gives me the chance to take a photograph which includes all the bits of the bird squarely in the frame and at least some bits of the bird in focus. And this one (right) has lost it’s head. Which brings me on to the start of our holiday on mainland Orkney. Often when we get anywhere it’s a question of dump the bags and lets go see what there is around on the beach (mountain, trees, etc). 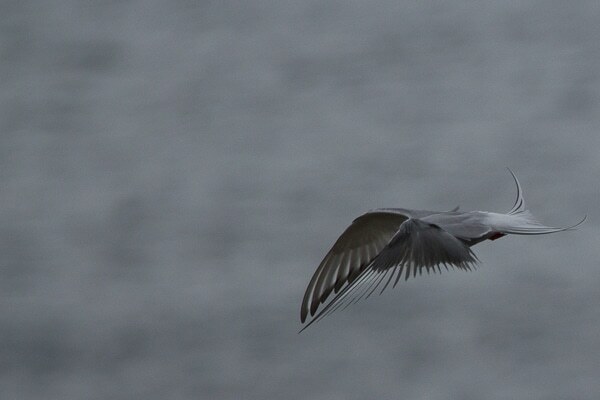 In Vancouver it was bald eagles flying past at head height, and Caspian terns. Madagascar, huge golden orb spiders. Bulgaria, Alpine swifts. Here on the beach at Birsay, it was a dead great black-backed gull. Which, after a close encounter with Jan, has also lost its head – the first souvenir of the trip. Generally speaking I like to wander round my local patch, or some other patch, looking at what’s around. Trying to find that redpoll in a flock of finches. Wondering why the great grey shrike that has perched on that tree at this time of year for the last three years ain’t there today. But occasionally it it is just a nice change – almost quaint (and there’s a word you don’t hear used in anger much these days) – to drive up to a twitch and find the twitchee ready and waiting to be ticked. And so it was a nice way to end and start the year. Brunnich’s Guillemot – or thick-billed Murre if you must – in Portland to end 2013, and an American Coot in Loch Flemmington to kick start the new. Well not too new because we only got there a couple of days ago. But in both cases we drove up, walked up – or in the case of the American Coot, got out of the car and stood up – and saw the bird in question from a distance that meant identification was unmistakable. 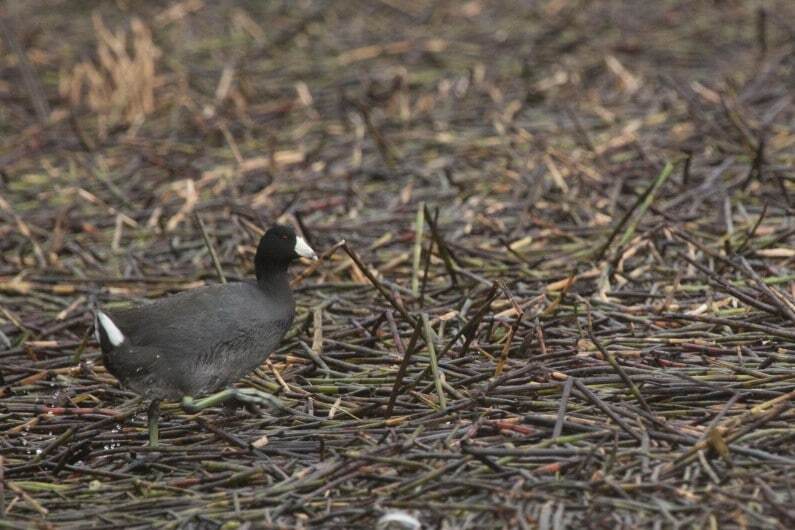 And the getting on the right bird was even easier given that there were no confusion species, or indeed any other species, within 100 meters. Now I know that birders are supposed to suffer for their art (science? hobby? passion? mildly entertaining interest?) and that a yellow browed warbler isn’t quite the same unless you’ve had to struggle out to the end of Blakeny Point to see it. Nor is a bonxie a true find unless it’s identified 3 klicks out in the teeth of of a gale amongst a flock of juvenile herring gulls. But that isn’t true for the blackbirds in the garden, beginning to go about the annual business of establishing nesting sites. I don’t feel I have to do a three mile hike, and then have to work hard to separate them from a variety of other thrushes. I can just enjoy them without any hard work. And at the turn of the year we were able to enjoy two vagrants to these shores in similarly easy and comfortable circumstances. And do I feel guilty about it? You bet I don’t.